This upcoming weekend is probably the biggest grilling weekend of the year here in the US. It’s our independence day on Monday and that means that we Americans will be celebrating by eating lots of meat, blowing stuff up, and drinking a lot of beer. One of the basic sides at pretty much every BBQ party this weekend will be coleslaw. It’s cold. It tastes great with burgers and steaks. And frankly, it’s probably the healthiest thing some people will eat this weekend. If you’ve never made coleslaw, it’s basically just raw cabbage which doesn’t seem very appetizing, but if you add a few other veggies and a thick mayo sauce, it ends up being pretty good. I figured I’d try the same thing with kale which I actually prefer to cabbage. 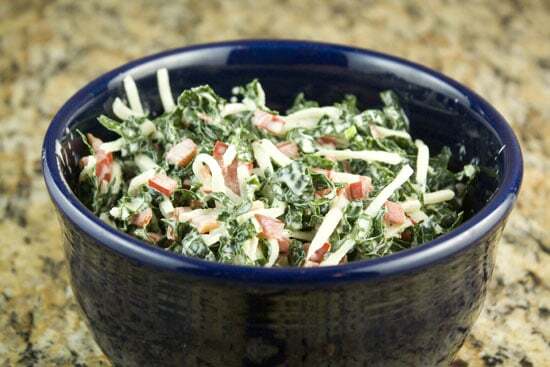 Raw kale can have a slightly bitter taste to it, but it’s not a problem in this slaw. 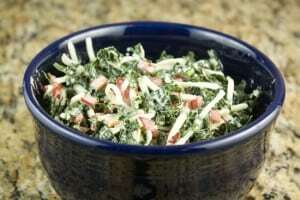 A great change on the classic coleslaw with kale, radish, and a spicy sauce. 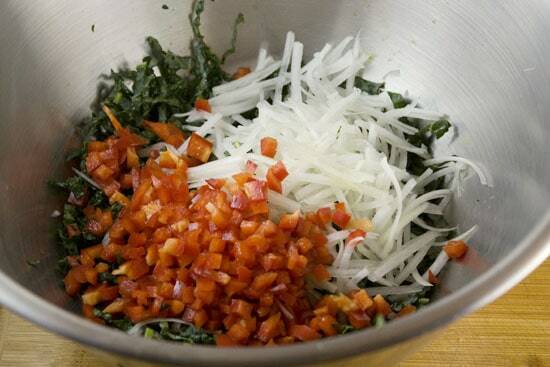 1) Remove ribs from kale leaves and mince finely into strips. Also shred daikon and mince red onion. 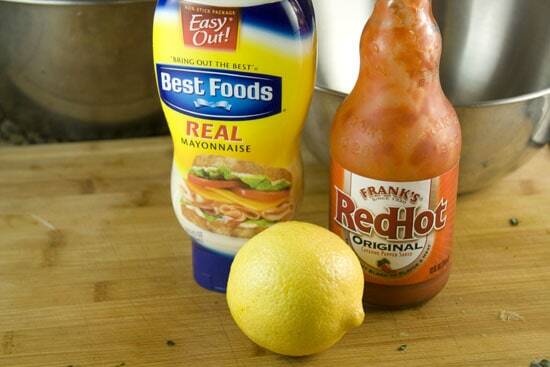 2) In a separate bowl, mix mayo, hot sauce, and lemon juice. 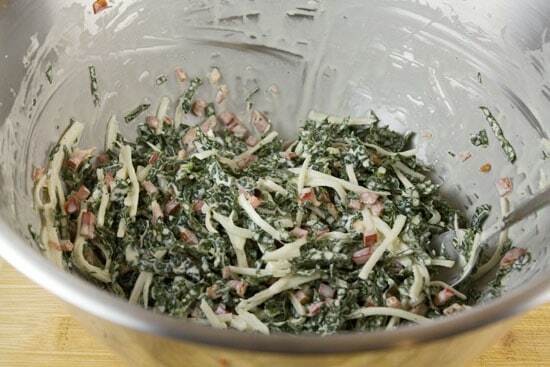 3) Pour dressing over slaw and stir well to combine. 5) Serve right away or make in advance. 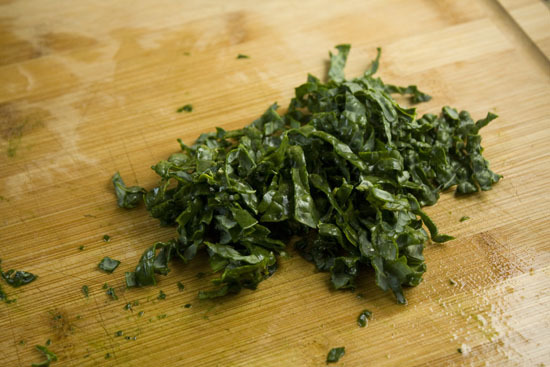 If you take a big bite of raw kale, you probably won’t be too happy. It usually has a kind of bitter, iron-like taste. If you steam it or saute it with some lemon, this completely goes away, but the raw stuff is a bit dangerous. This isn’t a hard problem to solve though in a slaw. Step one is just to make sure you take the time to prep your kale correctly. Cut out the bit middle ribs (stems) and then mince it very finely into narrow strips. Ditch the stems for this. 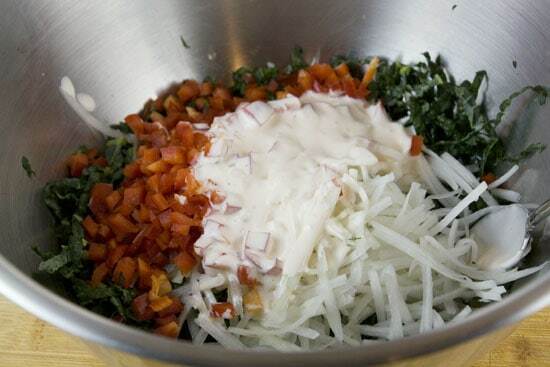 Speaking of veggies, make sure to take time prepping the other two veggies in this slaw also. If you’ve never used a daikon radish before, they basically look like albino carrots. They have a mild radish flavor though and work great in slaws like this. If you can’t find a daikon, you can use a few regular radishes. Just make sure to dice them finely. Over the last month or so I’ve been ranting pretty regularly about how I’ll never use store bought mayo again. Well, it didn’t take me very long to break my own rule. I wanted to make homemade mayo for this stuff, but I was out of eggs and the idea of going to the store just for mayo was a bit soul-crushing. So, back to the store bought stuff for this post. It worked fine for a slaw like this, but I think it would’ve made a noticeable difference if I would’ve made it myself. Homemade mayo is best as always. I just stirred my mayo with some lemon juice (1/2 lemon) and a few dashes of hot sauce. The hot sauce works really well with the kale flavor. Then just pour your dressing in with your veggies! Stir this all together and taste it for salt and pepper. It’ll probably need a good pinch of both. You could serve this stuff with almost anything off the grill. It’s a fantastic and interesting side that’s a great change from the standard stuff. 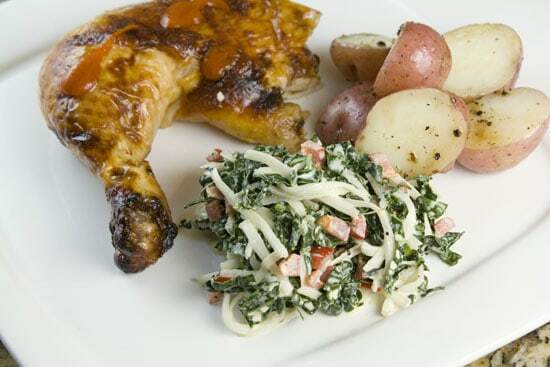 I served mine with my sriracha beer can chicken and some grilled potatoes. Very solid meal. If you’re sick of the old standard coleslaw and have ten or fifteen minutes, I think you’ll love the crisp flavors in this version. Give it a shot this weekend! I know what you mean by soul crushing trips to the store! Last night I was out of a few staples (things I never think to grab like mayo and soy sauce) so I drastically changed a recipe. I already had been to 2 supermarkets and a fish market that afternoon. I think the grocery store workers think I am weird because I am there every single day, sometimes more than once. GENIUS! Seriously, the best use of kale I have seen. Yum. Love kale (hate cabbage so great sub), but I really hate mayo. Anything that works as a substitution? Oddly enough, I happened to have the ingredients for this sans mayo. I used 2% Cabot Greek Yogurt. Very different but pretty good and I like that it is a creative use for raw kale. Win.